In my World of Care-giving, life can be rather unpredictable. It is true. From the outsider perspective it may seem like I live the same mundane routine each day but that really isn’t true. The reason behind that is because I am the caregiver of a combat veteran who suffers from PTSD, my husband in fact. Yes, PTSD is correct and yes, I imagine your first thought is along the lines of poor me and perhaps I should run away. Well, that is where I am going to have to disagree with you. Despite what the media portrays, living in a World with PTSD isn’t some gruesome horror movie. My husband went to war and with that saw and did things that the human brain is not programmed to handle completely alone. So, now that he lives back home in the civilian World he is torn between what the Military trained him for, the residual effects of war, and living as a civilian. Routine is what helps keep our brain functioning in a rational manner, but when you change that routine, chaos ensues. Think of it in the way a toddler skips a nap and turns into this whining screaming beast by evening. We have pulled my husband’s brain out of his routine and thus he is reacting very similar to the toddler only he also has the memories of war with him and thus you are left with quite the unpredictable situation. It does make things rough. See, you now have to completely adjust to this new person before you. Yes, they do tell you that you shouldn’t change who you are for anyone else, but I think many people misunderstand this part. You aren’t changing who you are, you are just readjusting the way some things are done. As an example being in a crowded place is commonly a no go for a veteran with PTSD, thus I don’t go to the store any old time. Instead I plan out the best times to go, like when the time of day or day of the week is a non peak time frame. I have gone so far as to do more on-line shopping even to handle things I don’t necessarily need to see in person right away. It helps a great deal with stress reduction. The point is nothing I have done to make life easier for us in this Life After Combat World has changed who I am. I am still the same person, with the same tastes and likes, nothing is going to change those. I did have to learn to become more patient with things as well as not to take so many things as a personal insult, which isn’t always easy. I mean how would you react if someone called you an idiot? Normally you would become offended and either lash out in return or you will feel very hurt, sometimes even both. This is where I had to learn the difference between my husband speaking and the PTSD talking. It isn’t knowledge that comes to you overnight either, you have to observe for some time until you can decipher the difference, but trust me there is a difference. Unfortunately for some the PTSD stays in control far longer than anyone would like. See, this is what I call the Dr. Jekyll/Mr. Hyde scenario. Dr. Jekyll being my husband in his normal mode and Mr. Hyde in PTSD mode. There was a time when my husband was stuck in Mr. Hyde mode for what seemed like forever! There wasn’t a day that would go by that he wasn’t angry, we weren’t arguing, and I didn’t cry. It was the darkest of times for us and I was at the pinnacle of leaving this relationship for good. However, when I told Mr. Hyde that I didn’t think I could do it anymore, he just stared off into space quietly. It was the very next morning when Dr. Jekyll peaked through the surface and pleaded with me. That was when I knew that leaving wasn’t the answer because my husband needed me, but he also needed me to help him. Leaving wasn’t the answer for my case. Unfortunately, that doesn’t work for all. Living with PTSD is no picnic and it does mean that you will have to learn how to cope because PTSD doesn’t go away. It doesn’t have to be what runs your life, but it will always be a part of it. It is working through that point of control that is the toughest. 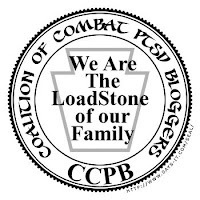 There are many veterans out there who haven’t reached that point of control on their PTSD and thus the whole family suffers right along with them. The biggest issue there is that the veteran has to realize they can control things and that they can lead a life where they aren’t stuck in the backseat. The role of support which falls to the rest of us is to do what we can to help them see that realization and thus they can get the help they need. There is surviving and thriving with PTSD. It is just a matter of discovering what works for your family dynamic. That is something you will have to work out, but as with anything a great support system can help you achieve it. So, despite the way the media likes to spin PTSD, it isn’t always that way. There are many families that prove surviving and thriving with PTSD is possible and attainable, I am one such example. It takes work and it takes patience, but anyone can do it if you just put your mind to it! Aimee, thank you for sharing that. I am in a similar Situation - married to a combat vet who suffers from PTSD. What sorts of things do you do when you are feeling lonely and having a hard time handling this? Things are getting hard for us and we have a 3 month old and I know I can't give up!